[CHART] Robots to Take 80 Million U.S. Jobs - Is Yours at Risk? Subject: [CHART] Robots to Take 80 Million U.S. Jobs – Is Yours at Risk? [CHART] Robots to Take 80 Million U.S. Jobs – Is Yours at Risk? Automation is a great thing – except for a lot of people looking for U.S. jobs. Over the next 10 to 20 years, half of all working Americans could find themselves replaced by some type of robot. That's what the Bank of England's chief economist, Andy Haldane, said in a speech last week to the Trades Union Congress in London. Haldane said the United States stood to lose as many as 80 million jobs to automation, and the UK 15 million. In October, the total number of non-farm jobs in the United States stood at 142,654, according to the U.S. Bureau of Labor Statistics. The "robots taking jobs" trend is already underway in many low-skill sectors such as retail and restaurants. You may have already noticed the "self-checkout" lines at your local grocery store or at Home Depot Inc. (NYSE: HD). As part of its turnaround plan, McDonald's Corp. (NYSE: MCD) has begun to install self-serve touchscreen ordering kiosks. Chili's restaurants are using 45,000 tablets to take customer orders. But Haldane warned that low-skill jobs won't be the only ones wiped out by automation. That means in addition to the impact on customer service and factory jobs you'd expect, we'll see big losses in skilled trades and administrative occupations. Nearly all job categories will be affected to some degree. Those seeking a silver lining say that technological disruption always has destroyed jobs while creating new ones. 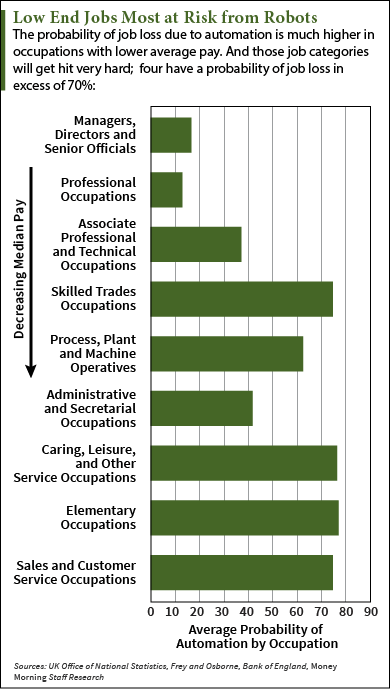 For example, nine of the 10 jobs in the most demand in 2012 didn't exist just a decade earlier. "We used to have a huge percentage of people working on farms. Now we don't. We used to have a lot of elevator operators, now we don't," Jeff Burnstein, president of the Association for Advancing Automation, told The Washington Post. "We've always been able to create new jobs. Twenty years ago, was there a job called an app developer? How about an SEO specialist, or a social media director?" The concern now is that the destruction of old occupations and the creation of new ones is happening at a faster and faster pace.